The goal of today’s blog is to push back against depression and discouragement. I want to encourage us to push through the oppression that seeks to rob us of our motivation, steal our joy, kill our dreams and destroy our future. My hope is that we will all discover the champion within. My hope is that we stand up against these bullies whose sole purpose is to convince us that we are losers who don’t have what it takes. My conviction is that we will stand in the face of adversity and fight to live the life God has called us to live holding unswervingly to the hope that we profess in Jesus’ victory over satan, sin and death. Through Christ’s victory He has made us champions we are more than conquerors! So the next time we face a formidable foe looking to dethrone a champion we will boldly proclaim, The Champ is here! You may say this all sounds well and good but how? I don’t feel like a champion. I don’t feel like a winner. I feel like giving up and giving in. My friends we all do at different times. I want to give you a game plan or a fighting strategy to help transform us into champions. All of this is by God’s amazing grace of course. # 1 Change Our Focus – The first step is changing our FOCUS. We must discipline ourselves to focus on our goals and what can be achieved not our failures and what hasn’t been achieved. Philippians 3:15-16 (MSG) 15-16So let’s keep focused on that goal, those of us who want everything God has for us. If any of you have something else in mind, something less than total commitment, God will clear your blurred vision—you’ll see it yet! Now that we’re on the right track, let’s stay on it. One of the biggest reasons that we never achieve our goals is that we lose focus. Usually failure is a result of losing focus and not seeing the bigger picture. Nothing is impossible if we set a goal and put our concentrated focus on achieving that goal. # 2 Our Decisions Define Our Future – We have to keep in mind that everyday we face critical decisions. These decisions most often define our future. These decisions are also shaped by what we truly believe. Deciding what we believe is paramount to our decision making process which ultimately shapes our future. John 8:30 (MSG) 30When he put it in these terms, many people decided to believe. No decision is a decision. Deciding not to act is a decision. Think about it in every day life. We can decide to better ourselves through higher education, starting a ministry, making a difference, who we allow to influence us, what we believe or don’t believe about faith, who we put our faith in and the list goes on and on. All of these decisions define us and determine our future. Conversely we can also decide not to act and live a life filled with excuses. # 3 Raise the Bar – I challenge everyone to Raise the Bar in your life! Champions pursue excellence daily. Isaiah 33:15-16 (MSG) 15-16The answer’s simple: Live right, speak the truth, despise exploitation, refuse bribes, reject violence, avoid evil amusements. This is how you raise your standard of living! A safe and stable way to live. A nourishing, satisfying way to live. The gut level truth is that if you have major changes that we want to make in our lives it is going to require us to rise the bar. We must set high standards for ourselves. Here is another hard truth, “In life you get what you are willing to accept and what you teach yourself to expect.” If we teach ourselves to be average guess what we will be? You got it average! I have heard it said, “Good is the enemy of great and the friend of average.” As champions in Christ let’s raise the bar in every area of our lives. # 4 Give Big Energy to Big Things, Don’t Sweat the Small Stuff – Be sure to give your time and energy to what matters most! Don’t Major in the Minors. Matthew 6:34 (MSG) 34“Give your entire attention to what God is doing right now, and don’t get worked up about what may or may not happen tomorrow. God will help you deal with whatever hard things come up when the time comes. Go big or go home:) Don’t get caught up in little things that don’t amount to a hill of beans. Give your life, time and energy to doing something bigger than you! Pick a fight with a giant you can’t defeat without God’s help. Choose an adventure that you can’t accomplish without God’s help. Live by the philosophy if anybody can do it than let them! Give me something nobody else can or wan ts to do this way God gets greater glory and we get a life well lived to the glory of God! Life it is too awesome and we were meant for so much more to get caught up majoring in the minors! # 5 Convert Our Knowledge Into Practical Actions – Don’t just possess knowledge put what you know into practice. Philippians 4:8-9 (MSG) 8-9Summing it all up, friends, I’d say you’ll do best by filling your minds and meditating on things true, noble, reputable, authentic, compelling, gracious—the best, not the worst; the beautiful, not the ugly; things to praise, not things to curse. Put into practice what you learned from me, what you heard and saw and realized. Do that, and God, who makes everything work together, will work you into his most excellent harmonies. The brutal truth is that most of us know everything we need to know to live the life we want to live and the life God has planned for us to live. In order to live like champions we must be able to convert knowledge into action. We are going to have to trust that we know what to do and then do it with all our hearts. Obtaining knowledge isn’t enough. Putting what we know into practice will allow us to live like champions and resist the temptation and schemes employed by our adversaries to bring us down in defeat. # 6 Follow the Leader – Great Leaders are Great Followers. Learn to follow. Be wise when you choose who you will follow because whoever you are following is definitely leading you somewhere. We must make it our goal to find mentors to lead us to places they have been and places we’ve never been. We must also be sure that the way they got there is a way that is pleasing to God and their practices measure up to the scriptures. We cannot lead well until we learn how to follow well. Following requires trust, humility and character. Proverbs 14:28 teaches us that the mark of a good leader is loyal followers and leadership is nothing without a following. It is critical that we be someone worth following. The greatest way I have ever found to become someone worth following is by following Jesus. Now that we have this knowledge what shall we do? Focus, Decide, Raise the Bar, Don’t Sweat the Small Stuff, Put Knowledge Into Practice, and Be a loyal follower! If we can do these things we will shake off depression, destroy discouragement, abolish oppression and live the life of a champion! 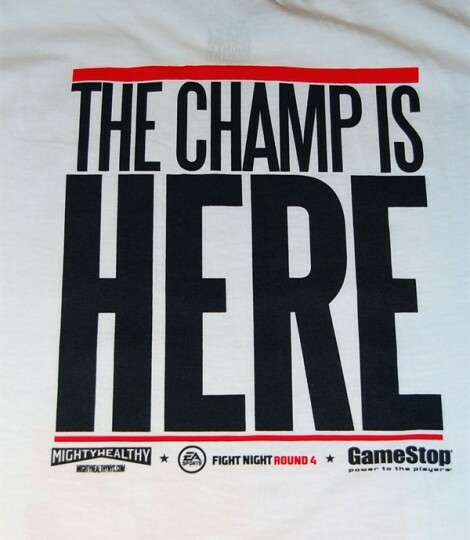 Find a place right now where you can see your reflection and state, The Champ is here! Be encouraged!